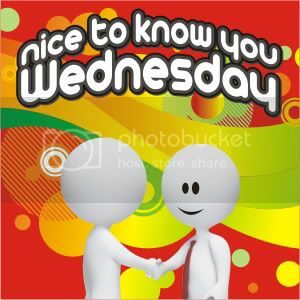 Hello there, it is Wednesday once again + welcome to the 2nd edition of Nice To know You Wednesday(NTKYW), this is a weekly meme that allows us to get to know a little bit about our fellow bloggers thru 5 interesting questions. I am very thankful to all who participated in our Maiden Edition, namely Mys, sis Shengkay + Trish,Raya + Chie101 (it was interesting to note that I now have an answer about how she came up with her online name, Chie Wilks ) , inspite + despite of me not promoting the Meme that much (I was in a hurry to make my post last Wednesday since I considered Wednesday + the number 3 lucky! Not that I am superstitious but I just have good vibes with them ). As a sign of my gratitude (+ since I am feeling rather generous this month) I will be giving $5 to Mys, who is my very first participant (kindly send me your paypal address via my contact form) + a little gift (which I shall be blogging about in a while) for all the other 4 participants (kindly send in your mailing details thru my contact form, too). Now on with today’s Meme. A little backgrounder: I was reading this month’s copy of Smart Parenting + saw one of my favorite deejays Delamar of RX 93.1, with her glorious baby bump. So it inspired the questions for today’s Nice To Know You. Join me in reminiscing or dreaming (if you haven’t experienced it yet) about our pregnant days. 1. What do you like best about being pregnant? 2. What is your most embarrassing preggy moment? 3. Was your pregnancy planned or surprised? 4. What I’ll miss most about being pregnant? 5. What are your preggy comfort food? 2. When I was pregnant there were several occasions when my tummy would act up + there is just no way I can control it even if my life depended on it! I’d feel the urge to throw up whenever I ride public transportation or the train, so I always have a clean plastic bag handy which I can use in case of emergency. But sometimes the good plan simply don’t work out resulting to embarrassing incidents. + the most embarrassing of them all was when I threw up in cab + the driver thought I was drunk (my tummy was just 4 months back then + it wasn’t very big at all). All the mess was on the car floor + Jared’s dad had to pay P200 for our ride to include fees for car wash! Totally embarrassing! 3. My pregnancy was actually a very lovely surprise. I told Jared’s dad that I should either be pregnant or giving birth by the time I turn 30 when we were just starting. We never planned or talked about it afterwards. So it was really quite a pleasant surprise when I found out I was 2 months on the family way the year I am celebrating my 30th birthday! Again the rules for this meme is simple. Just answer the 5 questions + include a meme badge (the badges are here) in your post. Link up + visit as many participants as you can! I’ll be waiting for your entries. Anyway, going back to the photo, what makes this all the more interesting is that, all the preggy mommies back then decided to drop by the next studio + have our photos taken + flaunt all our baby bumps (mine is just a bit visible around that time, since I started gaining a lot of weight into the 3rd trimester of my pregnancy) + cleavages. We recruited Papa Byron to be our photographer (he is very good by the way ) + he did a great job! I had about a thousand photos of all the preggy mommies stashed in a dvd from that pictorial, of course, not most of them are allowed to be posted here, so I chose the next best thing. We planned to have another session when our tummies are a lot bigger, but, sadly it didn’t push through + I really regret it since I only have only a number of photos when my bump was in its prime. Tell me about your preggy pictorial?